Calangute beach, located 16km from Panaji, the capital of Goa is popularly known as the 'Queen of the Goan Beaches'. This splendid palm-fringed beach is the most popular holiday resort in Goa, often crowded with people. Calangute is situated on the shores of the Arabia Sea in North Goa and encircled by the villages of Arpora-Nagoa, Saligao and Candolim, in the Bardez taluk. 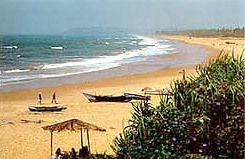 Calangute covers several sub-beaches, including Baga and Anjuna beaches. The beach and the fishing village was a favorite hideout of the hippies in the 70's and 80's. It was the hippies who discovered this pristine beach in the late 60s. Today, Calangute beach symbolise Goa's reputation as a haven for beach lovers. Calangute was not the original name of the beach, but a Portuguese distortion of the originally Goan name of "Koli Gutti", which means the land of the fishermen. Some people refer to it as Kolyianguttti, Kalangutti (village of art) Kolngutt, Kongott or Konvallo-ghott ( pit of the coconut tree) because of the abundance of coconut trees found here. Known for its idyllic beauty, Calangute attracts thousands of tourists. It is now Goa’s busiest and most commercialised resort. The beach is very crowded during daytime with locals and tourists. Laid with golden sand and no rocks, it is ideal for lazing around in the sun and swimming. The beach stretch is full of shacks and stalls selling delicious seafood and beer, seashell trinkets etc and hawkers selling sarongs. A lot of shows are held on the beach including rock and pop shows, open air dances and fetes. There are facilities for water sports activities such as para sailing, water-skiing and wind surfing which starts by afternoon when the wind is blowing in the right direction, and ends at sunset. A beginner can take some diving lessons or embark on fishing trips and Dolphin cruises. The road from the Calangute town to the beach is lined with Kashmiri-run handicraft boutiques with their famous papier-mache boxes, carpets and embroidery as well as a variety of bars and restaurants. There is a Tibetan market with stalls selling Himalayan curios and jewellery in the town. There are high quality textiles mainly from Rajasthan, Gujarat and Karnataka. Over all this beach is the perfect place to spend a holiday. On the way to the beach there is a statue of Bandodkar, Goa's first chief minister. The Kerkar Art Complex, located on the beach is a popular center for exhibitions of arts and crafts of local artistes. Concerts of Indian classical music and dance are held on Thursdays and Fridays here. On the road to Mapusa (8km) stands Calangute's Church, St Alex with its unusual dome and two towers. The interior is beautiful with its architecture and the gold and white ornate altar with shell niches. There are plenty of good places to eat and drink. Beach shacks are mostly simple semi open aired, palm leafed huts, which specializes in sea food. All serve cold beer. Reggies Bar and Golden Eye are good shacks.